I’ d been thinking about Dawa, about the Dahlia’s and about where the heck I might get a center post for a Bogen tripod. I have every thing but and I had told Dawa I would get him a tripod so he could play with his camera in some new ways. Only it turns out that center posts for these old workhorses are rather rare. I was feeling a bit dismayed by learning this – it was an unexpected turn of events as were the flowers. The Dahlias were not looking right – not nearly as full and densely packed as in years past and the Gladiolas seemed slow and I had been wanting to ask him how to cultivate the heart. I didn’t know what to say to that (and I still don’t) so said I was going off to the Cosmos patch to photograph and at that his face lit up: “Cosmos are very resilient and in the wind they dance.” With that Dawa turned and went back towards his house and I wondered off to the Cosmos patch on the other side of the ranch. 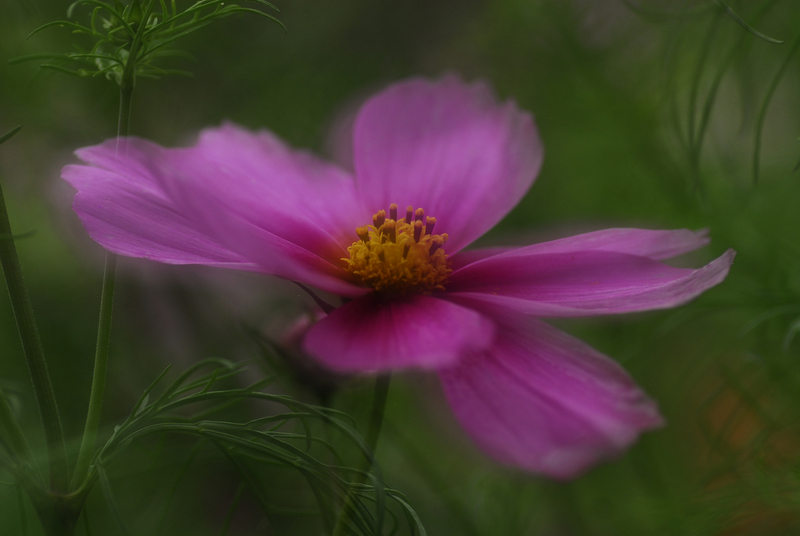 Cosmos are happy flowers and you can see them through all kinds of eyes. Through the eyes of a gardener, through the eyes of a photographer, and through the eyes of a child. I see the light of happy happy shine on Dawa’s face when ever we speak of flowers and our shared love of beauty and of flowers does indeed cultivate both of our hearts. I love how we are often flying together with the same flower. I am struck by how bulbs showed up in each of our lives recently. And, your cosmo photo is one of my new favorites. I see happiness and dancing and flight. I really enjoyed reading this. Absolutely beautiful photo and I enjoyed reading Dawa’s wisdom of giving.